A top decision maker in Syria has said “the US has sent a message to the Syrian president Bashar al-Assad that expresses the US establishment’s wishes. Under these wishes there is an Israeli goal compatible with Donald Trump’s objective to pull out its own forces from Syria with as little damage as possible. Trump would like to avoid the same fate that hit the US forces during George Bush’s era where thousands of US soldiers were killed in action”. ”The US will leave al-Tanf crossing and abandon north-east Syria in al-Hasaka and Deirezzour as soon as possible. The only condition is for Russia and Syria to guarantee a total withdrawal of all Iranian forces from the Levant. The US is ready to leave the Kurds and let these continue their negotiation with Damascus. The US establishment will recognise Assad’s authority over Syria but Iran must leave”. “Iranian forces and their allies came to Syria under an official request by the central government and will leave when this government asks the allied forces to leave, and only when all terrorists have been eradicated from the Levant”. “You – said Assad – came to Syria without any permission and occupied our territory. It is therefore our duty to push you out by all means. You shall not obtain by negotiation and peace what you failed to obtain after seven years of war”. Russia played the role of postman for the exchange of the US-Assad messages. President Assad, however, informed the Americans that Iran is not interested in remaining in Syria once all terrorist Takfirees are killed and when its function is no longer required. The bottom line is that Assad and his allies believe that the US-French-UK withdrawal from Syria would actually be an achievement. Moreover, both Iran and Hezbollah consider their withdrawal both a fact and a necessity, once Assad is no longer in need of their contribution. However, there is still al-Qaeda in the Levant, and other jihadists in the north under Turkish control. Also, there is still ISIS in the north-east within the US-controlled area. All these can only be eliminated once the Syrian Army and its allies wage war against them. 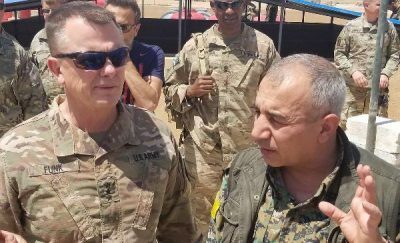 From this point of view, the US proposed “deal” is feasible and is considered reasonable by Assad and his allies- but only once the very last US soldier has left Syria. Russia will act as guarantor for its own allies, and these will commit to leave Syria once all jihadists no longer pose a threat to the central government. Damascus and Tehran look at this “deal” positively but this does not mean they trust a US establishment led by a President who can unilaterally revoke his own signed deals, just as he did for the Iran Nuclear deal he signed with his allies. Moscow, Tehran and Damascus are aware that Trump cannot realistically keep his forces in Syria for very long, particularly since the south of Syria is about to be liberated. Israel, of course, is trembling – so this source believes – at the idea that Iran could create a copy of the Lebanese Hezbollah in Syria because the menace will be much greater along a united but very long border from Naqoura (Lebanon) right through to the occupied Golan Heights. But in the midst of all this, Assad considers the real war is over: he now has to deal with only two countries rather than with hundreds of non-united, disparate groups. The Syrian President believes that Syria, as a multi-ethnic, secular and multi-cultural country, has triumphed: it has definitively won the battle against “regime change” and the partition of the Levant.